Been a while, but this is still being built. My linear rail, bearings, ballscrews, supports etc from Fred at BST should be here in a few days. Can't wait. I've changed my design a little bit. It will now be bench mounted, so the base is a lot shorter. See below. 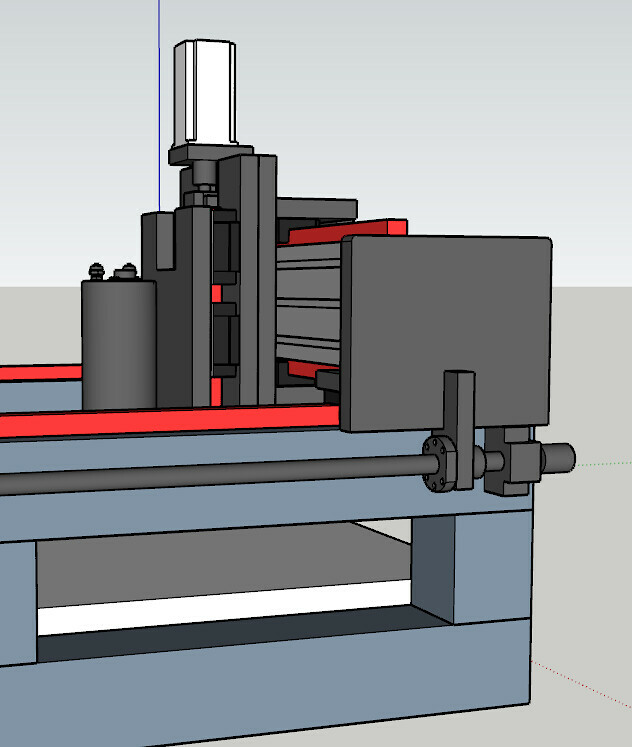 I've also swapped out the aluminium extrusion in favour of 50x50mm steel box section. Space isn't a major problem, so I don't have any problem with the motors sticking outside the envelope of the machine. Other than that, is there any other reason I should go with belt driven ballscrews? What is your free Z height ? Maybe you could lower the bed in your design a little to free up some space. What material thickness are you looking to cut? -Option to change steps per mm later on. -Less stepper vibration transfer to cutter. and "belt pulley reduce" the ballscrew rpm vs stepper without losing resolution. This is usefull when you hit the critical rpm for a given ballscrew/pitch vs speed. Also some high pitch screws tend to be more efficient. But since you already ordered this is a non issue..
Did you order ballscrews prepped for pulleys? I ordered mine with a slightly longer F lenght shaft... 30mm of pulley shaft. Last edited by driftspin; 12-09-2018 at 05:26 PM. Whoops....I just placed a sketchup model of the 2.2kw spindle into my model and the tip of the collet was touching box section. I'll need to add....how much below that? 100mm, 150mm? With that z height, 0mm lol. I'm hoping go from 0 up to 30-40mm. Nope. I ordered plain finished ballscrews which couple directly to the steppers. Would 3.1Nm steppers be enough here or should I go to 4Nm? 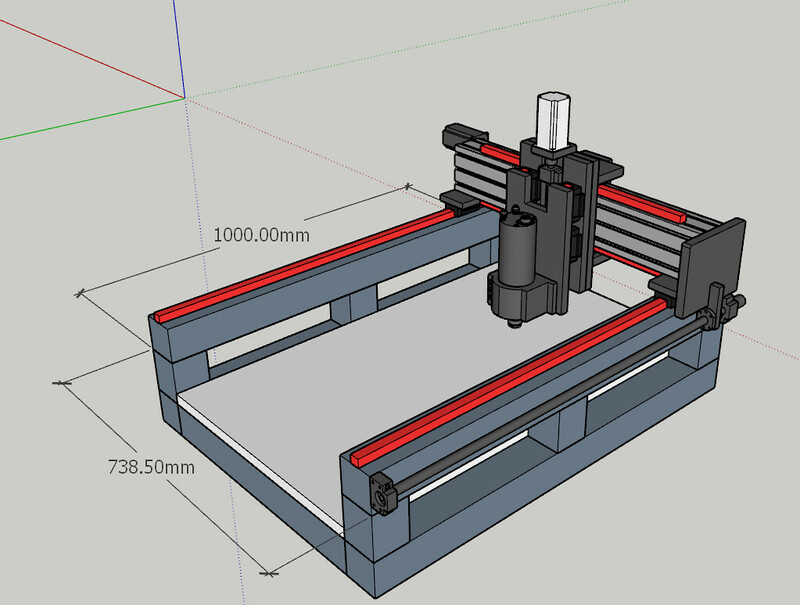 Just realised I only ordered three ball screws, and I'll need a second one for the Y axis...I'll have to get one locally or add it to my order for the spindle and electronics from Fred. Does it look rigid enough with 50x50mm square tube? Thanks very much for taking the time to answer my questions. Much appreciated. Well 50x50 does not sound like a lot. webbed in the bed it could be enough. If you decide to go 50x50 at least make sure it is 4 or better 5mm wall thickness, much easier with tapping threads. The main thing is your total footprint. When you can run FEA on your design you know. I did some basic checks on my design. Quickly went for 80x80x4 bed and 80x120x4 gantry parts. Get end caps on the box section. I think you need to make the gantry as rigid as reasonably possible. Only 3 cm extra in the design. Last edited by driftspin; 13-09-2018 at 06:16 PM. I went with the 50x50mm because it was free for 7.5m length :). If I go to 80x80mm, I will have to shrink the height due to the cost. The new 80x80mm design would look like the one attached. What do you think? I've also increased the free space between cutting bed and spindle to 130mm. 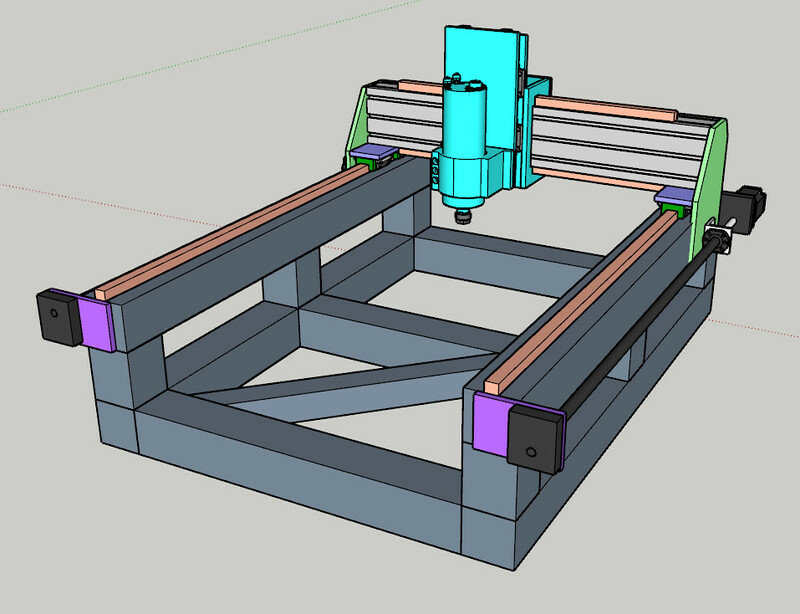 My gantry is already 120x80mm. Just make sure ther is enough meat to tap threads in for the linear rail bolts. Also you need at least 4cm of width flatsurface to pour epoxy on the steel. Make sure you have that. Why are the the z carriages up that high? Move those to the top and lower horizontal plates. So top Z and Y and bottom Z and Y carriage are really close to gether, assuming X is the bed. I did that because the further I move them apart, the less z height I have, because I have only 300mm rails for the Z axis. Here is the machine at the moment. The z axis is at the lowest point of its travel. 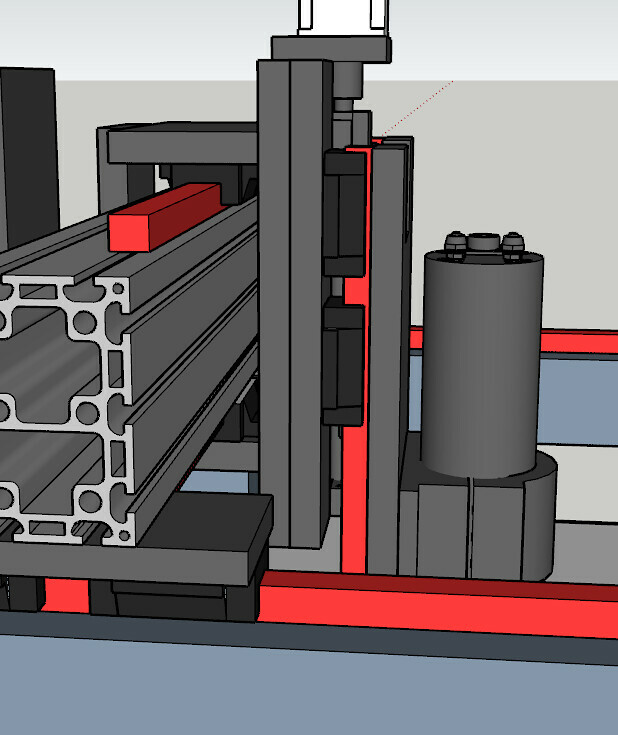 I've modelled the ballscrews and rails etc exactly as they are. They arrived a few days ago. 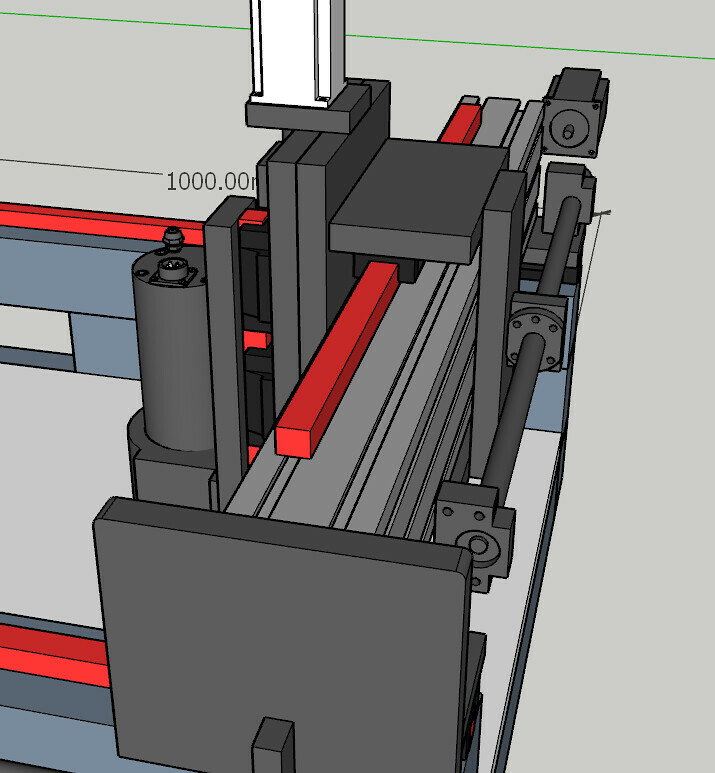 Still waiting for the second ballscrew for the x axis. My only problem was trying to keep the z axis as close to the Y as possible, so that there is less overhang or twist forward on the gantry. So I had to move the ballscrew to the back of the gantry. Not ideal, but with everything being 16mm and 20mm alu plate, I figured it wouldn't pose too much of a problem. Thoughts? I have now sourced 80x80x5mm steel box section, and I got it through a friend at work for £76 for a 7.5m length. Not too bad! I've also ordered a 2.2kw water cooled spindle, 425oz motors and drivers. I'll be buying the transformers and caps soon for the power supply. Any idea what control board I should use? 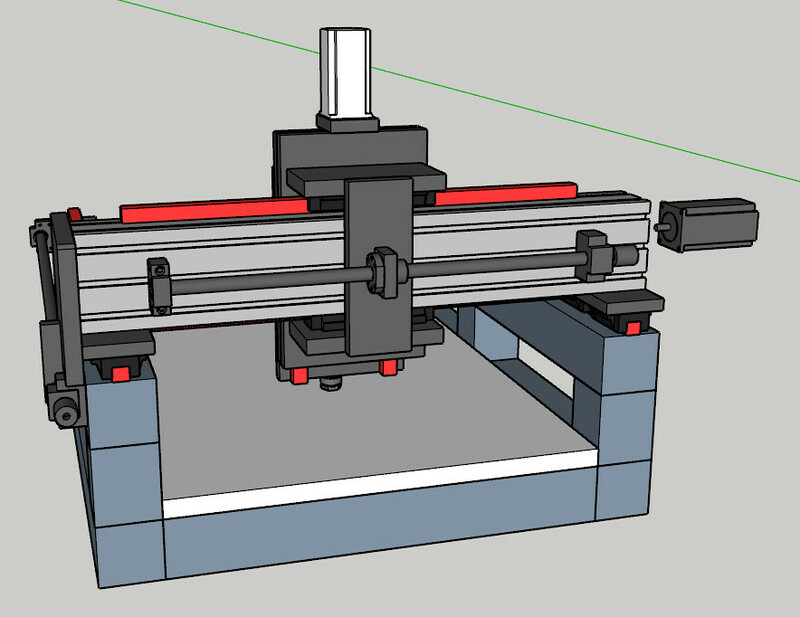 Note I haven't modelled the second ballscrew for the x axis. Its basically a copy of the right hand side one. For controls... well it all depends. I have UCCNC / 300eth icw two cheap 5 axis boards. trying to delay buying UB1. Will you be running 3 or 4 steppers? A single 5 axis board icw 4 steppers and auto homing 4 axis X-A Y and Z only leaves you with 1 estop input left and no Zero probe input. I think UCCNC does everything you need. Check out what controller fits your needs. I have no experience with something else so please ask around for opinions.